Approximately 10,000 ago the first paleo-humans ventured into New England at the end of the last ice age as the glaciers retreated. The animal and plant life they encountered included such wonders as the American mastodon. 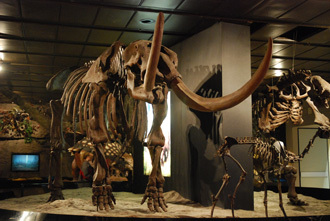 Although today it is hard to imagine seeing mastodons in New England, the American mastodon (Mammut americanum) was one of the most common species of large mammals that lived here over a period of several thousand years. Others included the Giant Beaver (which were six to seven times the size of modern beavers and weighed about 300 pounds), and the Dire Wolf (which was larger and more powerfully built than the modern gray wolf). These large animals, which include mammals, birds and reptiles are known as Pleistocene megafauna, as they lived during the Pleistocene era (10,000 to 2.5 million years ago). Today the largest North American land animal is the American bison. The American mastodon was related to modern elephants, which they superficially resembled, having long tusks and a flexible trunk. They were stockier than elephants with thicker limb bones and they had a coat of long hairs, which was probably a rich, dark brown. 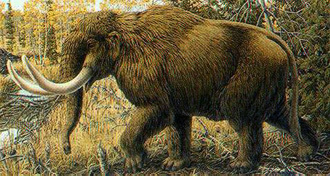 Mastodons most closely resembled the extinct woolly mammoth but were smaller, with shorter limbs and straight, rather than spiraled tusks. It stood up to 10 feet tall at the shoulder, was up to 15 feet in length and had long tusks that could exceed 16 feet. It weighed in at somewhere between 8,000 -12,000 pounds. 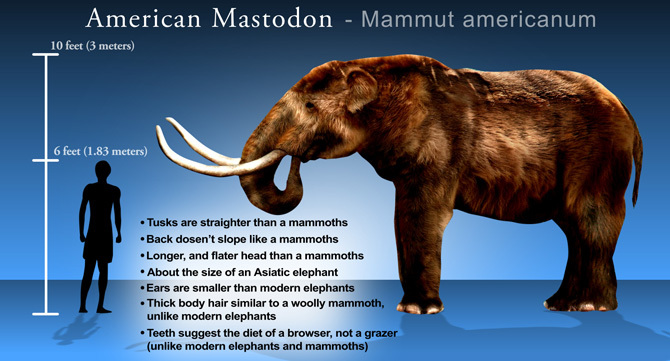 American mastodons were herbivores, browsing on trees (mainly coniferous), shrubs and swamp plants. Mastodon teeth differ dramatically from those of mammoths as they had blunt, conical, projections on the crowns of their molars, which were more suited to chewing leaves than the high-crowned teeth mammoths used for grazing. The social behavior of mastodons is a controversial issue. Many of the archeological finds are of solitary animals leading some to suggest they did not live in herds or at least not in large numbers like elephants. Mastodon young were thought to have taken around 10 years to reach sexual maturity requiring a longer period of maternal protection than elephants. Consequently, American mastodons may have lived in matriarchal groups like modern elephants, as the long term investment in raising offspring is a risky strategy that benefits from protective herding. 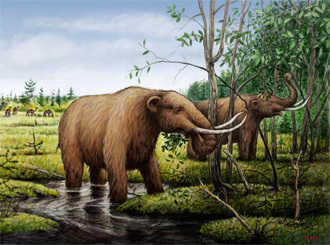 Though their habitat spanned a large territory, American mastodons were most common in the cold ice age spruce forests of the eastern United States, as well as immediately south of the Great Lakes. Much of our knowledge about the mastodon’s presence in New England has come from fishermen. Mastodon teeth have been dredged up in numerous locations off the Atlantic Coast, in some cases over 180 miles offshore. This indicates that they were here at a time when sea levels were lower and the coast extended out farther. Mastodons lived from about 3.7 million years ago, with the last of the mastodons, the American mastodon, dying out around 10,000 years ago. Preliminary archeological evidence suggests that some may have survived in Michigan until 5,000 years ago. 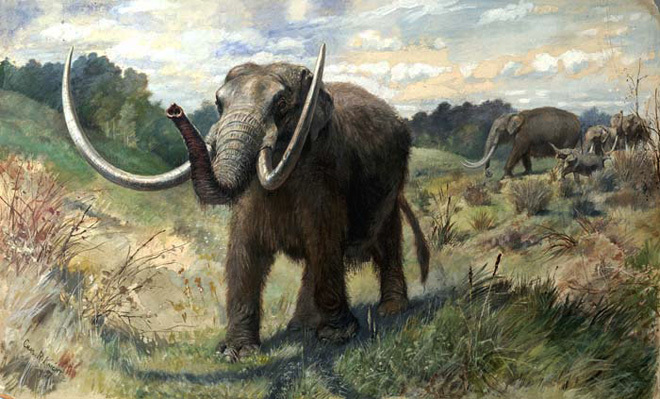 Recent studies indicate that tuberculosis was common in late Pleistocene American mastodons, and it has been suggested that this could have contributed to, but not been the sole reason for, their extinction. Another factor contributing to their eventual extinction may have been the presence of paleo-humans, who entered the American continent in relatively large numbers 13,000 years ago. Their hunting may have caused a gradual attrition of the mastodon population, significant enough that over time the American mastodon was hunted to extinction. Two other potential theories include climate change and an asteroid or comet impact. Whatever the reason a magnificent creature disappeared from the face of Earth forever.